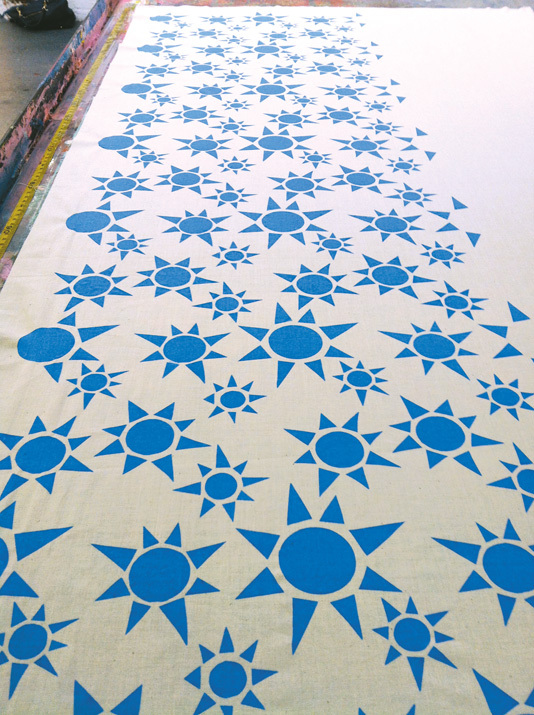 At the end of June I went to a screen printing workshop at Harvest Workroom. It was so good to spend the weekend creating – I know it might look like I do that a lot, but it's incredibly rare that I'd spend two full days in a row just making, particularly with my own designs. It was such a luxury! Emma was our tutor for the workshop and we started Saturday with a run-through of what to expect for the weekend and a demonstration to whet our appetites. It was then down to business – sketching ideas that we'd turn into screens for layering. We did the shapes on paper first and then traced them onto the Ezi-cut paper which is taped to the screen for printing. 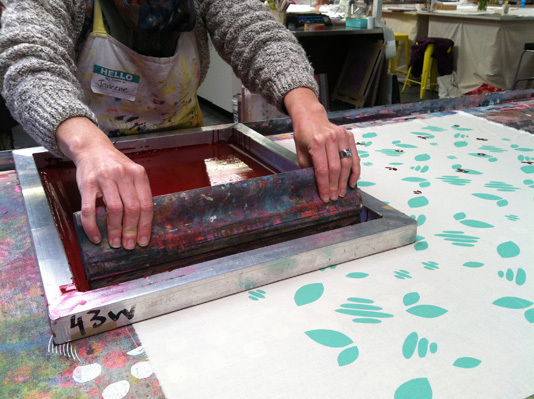 We worked in pairs, smoothing our fabric down on the work table – one holding the screen, while the other did the printing. It's quite nerve-wracking putting down that first layer of colour – but lovely when it works! 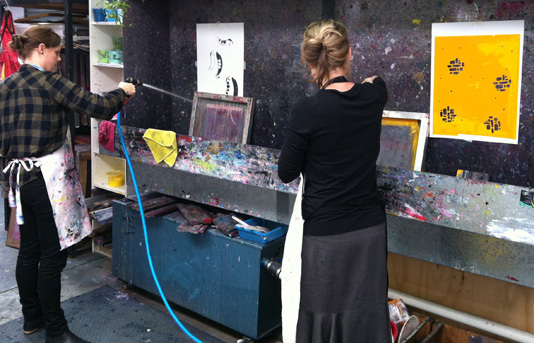 Then, once you've done the first colour, in this case as many times as we could fit it on the fabric – we were going a bit freeform at this stage – it's off to the sinks to wash all the ink off so you don't ruin the screen for the next person. 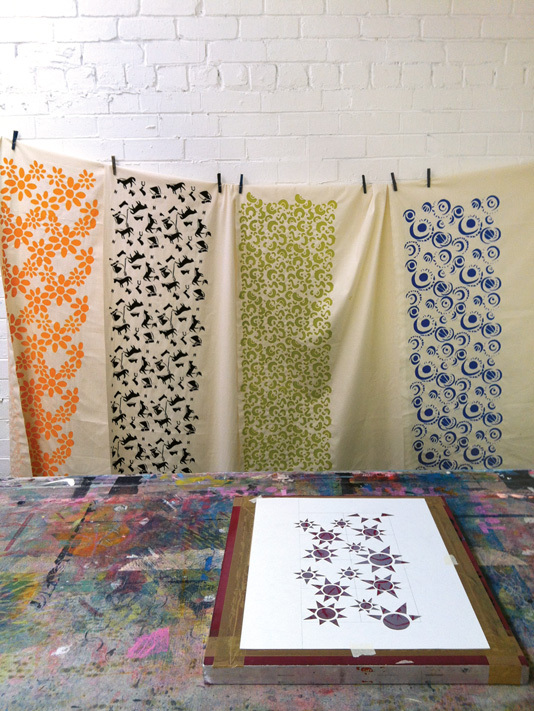 On Sunday Lara, one of the co-owners of Harvest Textiles, joined Emma to teach us how to do Swiss repeat patterns. This was taking one motif, and one colour, and turning it into a repeat pattern. It made it slightly easier using a variation of the motif from the day before – with a bit less cutting this time! 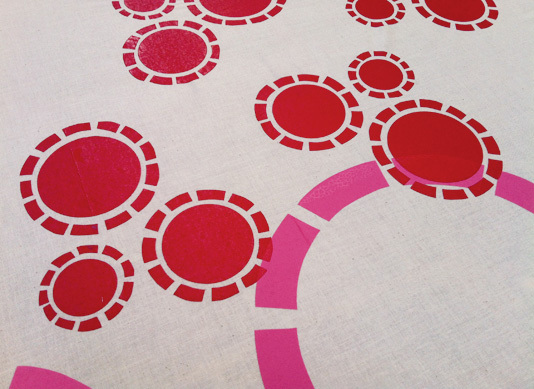 We used a 20cm width, so the pattern repeated at that interval along the table. You can't exactly tell what it's going to look like until you get it working down the fabric. Again, it's slightly scary since you print at say 20, 60 and 100cm and it's not until you go back and do spots 40, 80, 120cm etc that you can really see the effect. It was such a good weekend – I didn't want it to end. It was also fascinating to see what everyone else created – such different patterns and colour choices... I'll definitely be going back for more! Looks like great fun. It seems some other people also gave themselves cutting out nightmares. What do you have in mind for your finished product? You'll see one finished product on the blog in the next couple of days and the other part-complete by the end of the month hopefully! I love the red and pink print! It doesn't look as though it needs any extra colours.